For this weeks #SundaySupper we are having a Picnic and we all know the best part about a Picnic is how fun all the different recipes are to taste test! I chose to make a Fully Loaded Baked Potato Salad for this weeks picnic. I can't wait to read through and make a few of the different ideas there's always so many amazing recipes shared during #SundaySupper. A huge Thank You to T.R. of Gluten Free Crumbley for hosting. 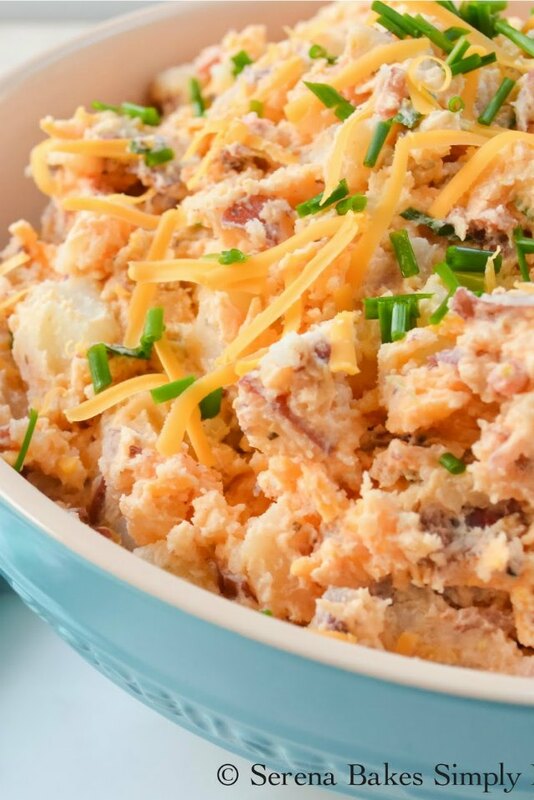 Fully Loaded Baked Potato Salad is a must have for summer picnics. It's taken me a bit to perfect this recipe. I started off the first few times making it with leftover baked potatoes but the potato texture was never right. So I went with boiled red potatoes and left the skin on for texture and loaded it with all our favorite potato toppings. I love to have a few different potato salad recipes for Summer Picnic's and BBQ's. There can never be too many options at a picnic on the table! 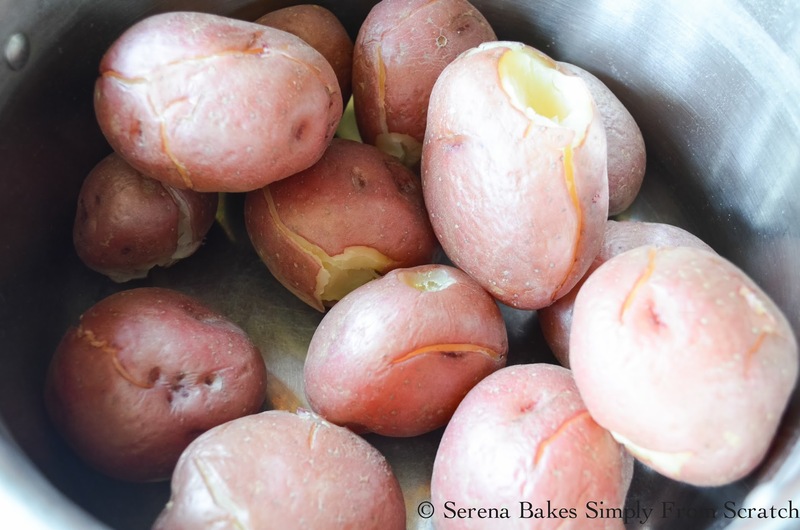 Place 5 pounds of Red Potatoes into a large pot and cover with cold water. Bring to a boil and cook for 30-45 minutes until potatoes are fork tender. Drain water and allow potatoes to cool uncovered. Dice potatoes with skin into bite size pieces. 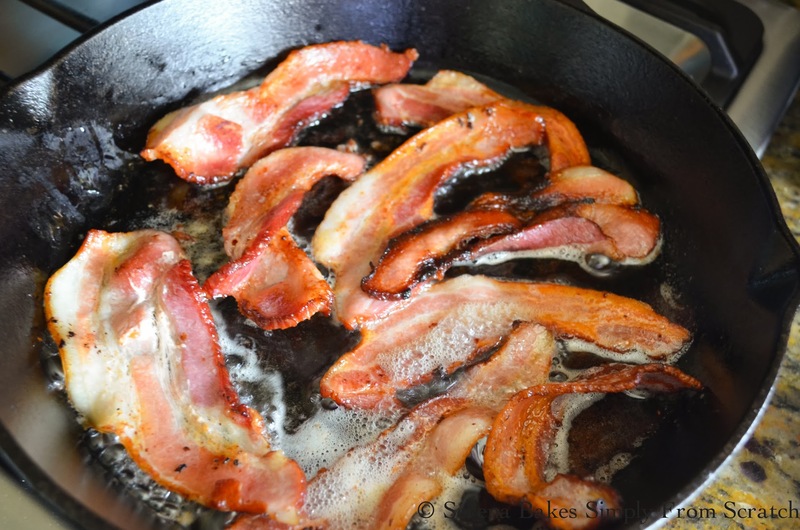 Brown 3/4 pound (about 8 slices of thick bacon) until crispy. Once Bacon is cool enough to handle chop into little bits and add to potatoes. 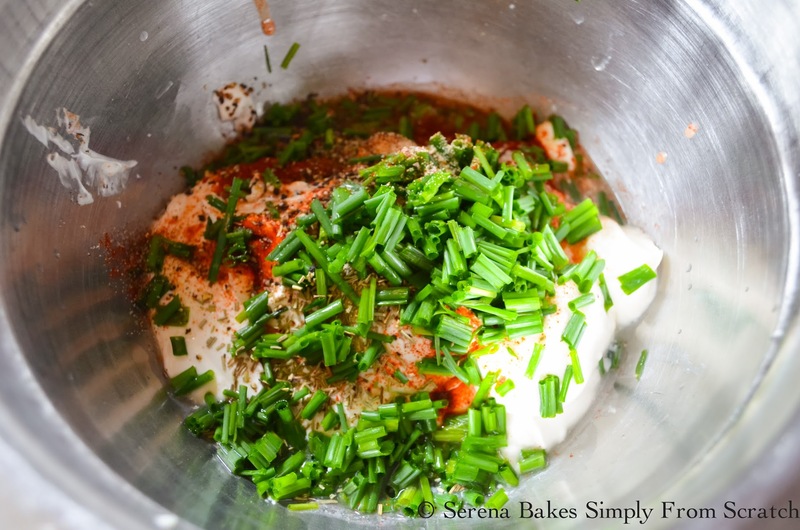 In a small bowl add 1/2 cup Mayonnaise, 2 cups Sour Cream or Greek Yogurt, 2 tablespoons White Balsamic Vinegar, 1/2 teaspoon Rosemary, 1 teaspoon Granulated Garlic, 1 teaspoon Smoked Paprika (optional), 1 teaspoon Sea Salt and Pepper or To Taste and 1/3 cup Chopped Chives. If your like me you just now realize you forgot a teaspoon of Dijon Mustard so you better add it now. Toss mixture with potatoes until well coated. Refrigerate until cold about 3-4 hours. Stir in 2 cups Shredded Cheddar Cheese. Sprinkle with a little more Shredded Cheddar and Chives before serving. Another favorite Potato Salad for all the summer festivities! 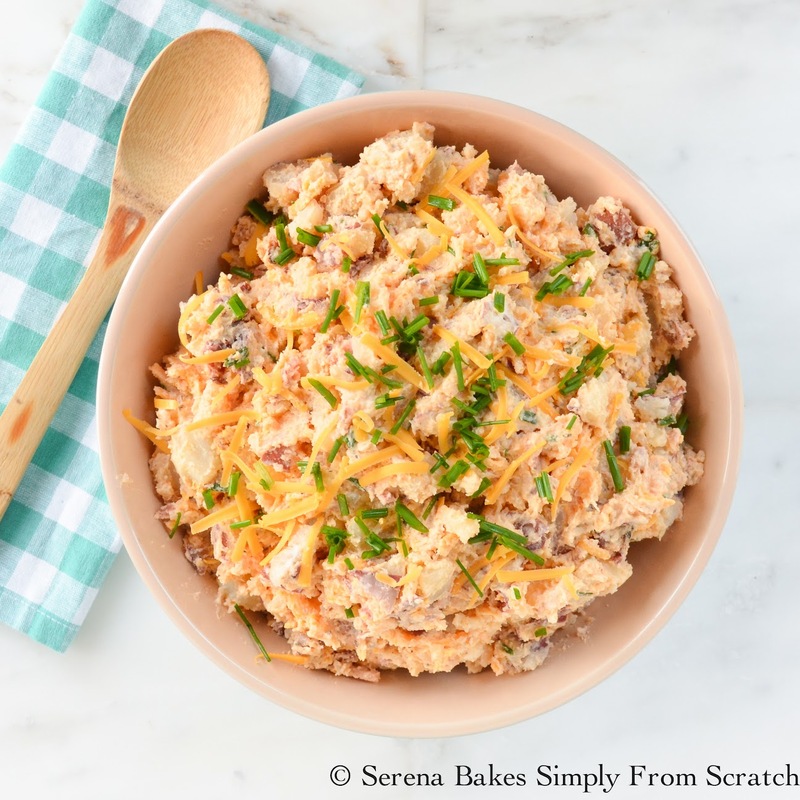 Make sure to check out all the other fun Sunday Supper Picnic idea's below the recipe. I know you'll love 'em all as much as I do! 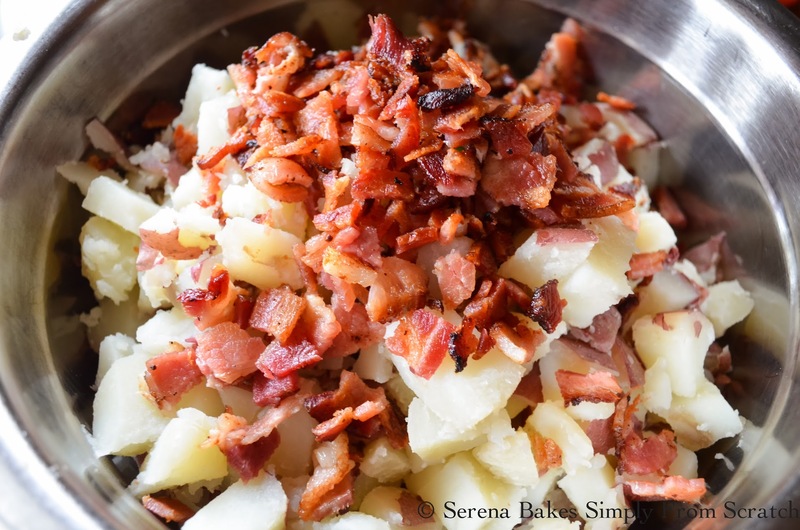 Fully Loaded Baked Potato Salad filled with skin on red potatoes, bacon, sour cream, cheddar cheese and seasonings from Serena Bakes Simply From Scratch. In a large pot add red potatoes and fill pot with cold water. Bring water to a boil and cook 30-45 minutes or until potatoes are tender when poked with a fork. Drain potatoes and allow to cool. Do not cover pot while cooling so moisture can escape. Once potatoes are cool dice into bite size pieces leaving skin on. In a small bowl stir together bacon, mayonnaise, sour cream, white balsamic vinegar, dijon mustard, rosemary, granulated garlic, paprika, sea salt, pepper and chives. Mix until well combined and pour over the top of potatoes. Stir until well combined, cover, and refrigerate until cold. Stir in grated cheese and serve. 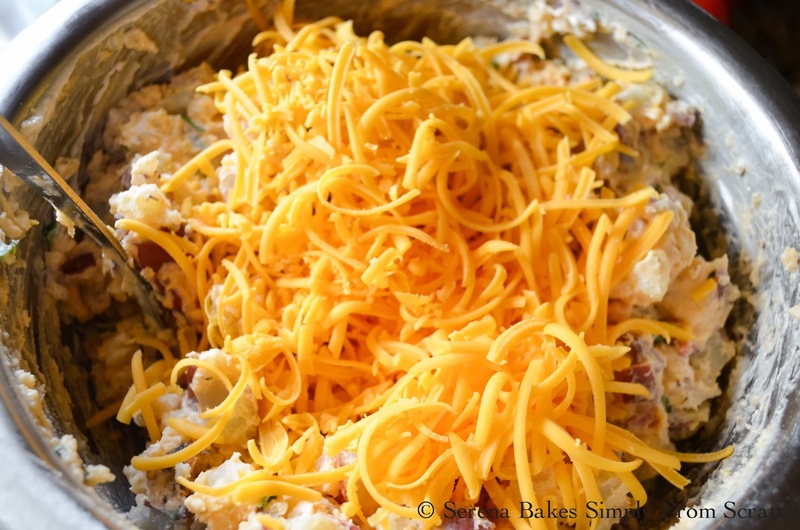 I love a good potato salad at a picnic, but have never had a baked potato salad...I need to change this, quick! That looks so flavourful and yummy!!! Never thought of baking potato salads, that's an awesome idea. Serena this looks awesome, just pinned! Nothing better than this salad, it has everything I love, YUM!! You got all the good stuff in here! I need some of your potato salad in my life. Some tasty flavors in there, great addition to the picnic table! Oh yes!! I love loaded potato anything!!! Going on my MUST make list! Excuse me while I face plant into this salad! I love potato salad but you have just made it look a million times better! Oh, my gosh, this would be a huge hit with my gang! Next opportunity, I'll be making this!!! Wow, that has got to be the best potato salad I have seen in a long time. Oh gosh! I really love this--potato salads in a souped-up version sound like a very good idea right about now :) thanks for sharing! Now THIS would be a potato salad I'd enjoy! I love all the yummy ingredients in this salad. What a comforting, fabulous side dish! I love that you turned loaded baked potatoes into an easy picnic dish! This is brilliant! I love this! It's like all of my favorite things mixed together! Great for a big family picnic! 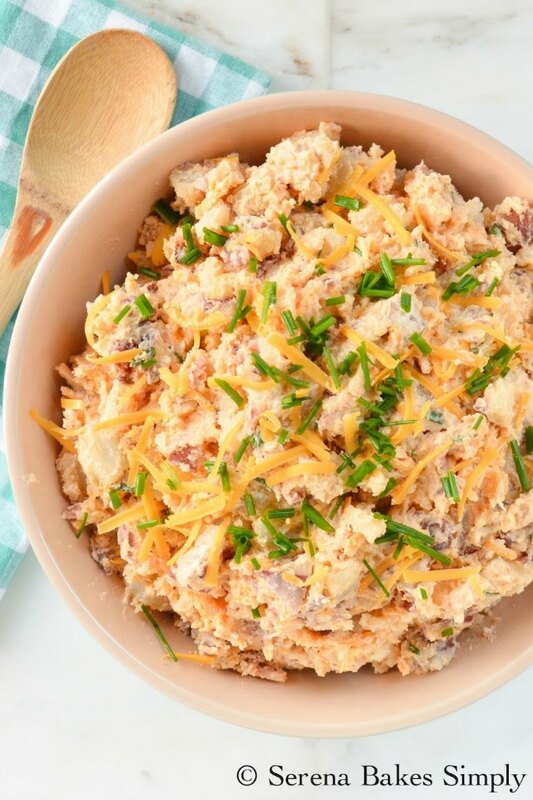 This potato salad just screams summer, barbecues, and picnics! Oh YEAH! Fully loaded is the only way to go! Love this! Great spin on the iconic baked potato!